I intend to write a follow up to Levi’s birth. Whatever, it’s my blog, I’ll write these in any order that I please! … It’s so hard to write anymore. He was put off by this… Though in retrospect, me wearing nothing but an old pair of boxers may have contributed to this. Nothing makes you feel dirtier than yelling happy birthday to your 4 year old son while wearing practically nothing. Whatever, this wasn’t part of the plan. I forgot that when kids are excited about something they wake up at weird hours. Today Noli was up at 6:30. You know, I don’t even know if he woke up on his own or not, it’s very possible Milo woke him up. All I know is that I was awakened to the screeching sound of two little boys playing wildly over Milo’s monitor. It’s very hard to tell the difference between outrageous kid laughter and outrageous kid murder. They just scream. There’s not even cackles or pauses for breathing - just one long continuous squeal. It’s awful. I don’t care how many poems romanticize the sound of a child’s laughter, I hate it. Well in any case - normally when the kids wake me up with their obnoxious happy noises, my response is to half-nakedly go upstairs and yell at them because my exhausted rage does not provide me the rationale to put on a pair of pants in the morning. However, Rach and I had sworn to be extra nice and forgiving for Noli’s birthday (yeah, I really sound like father of the year right now), so while I may not have had the right mind to put some clothes on, I at least got it together enough to feign some happiness for the little guy’s big day. He was grumpy all day nonetheless. Grumpiness is one of those things we’ve been dealing with. 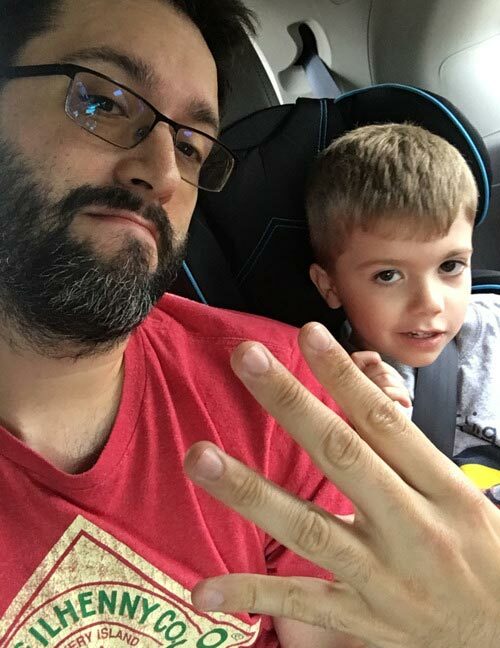 Terrible 3’s have been in full effect. Tantrums, grumpies, defiance, aggression - we’ve got it all! What’re you gonna do though. We sucked it up, gave him toys, gave him chocolate-chocolate chip muffins, gave him ice cream, and gave him lots of grace. Our resources were exhausted to say the least. The words “Happy Birthday” were a trigger. Presents, however, he had no problem with those. Go figure. Noli is such an enigma sometimes. He’s the sweetest little boy. He just wants attention, hugs, kisses, more attention; He loves to talk about superheroes, loves to talk about Legos, loves to just talk in general. Holy moly if you trigger him though. He goes dead silent. Sometimes he’ll run away, sometimes he’ll just hide and make this ticked off grunting noise whenever you ask him what’s wrong. It’s hard to figure out the things that set him off because he refuses to communicate what those things are. Once you’ve reached this point, parenting becomes a very delicate, dangerous dance. You have a choice: either you cater to his needs, give him what he wants, and say you’re sorry (even though you have no idea what you’re apologizing for)… Or you discipline. Truth be told, I don’t want to raise a bratty kid, so 9 times out of 10, I choose discipline. There’s a 99.9% chance of a tantrum at this point and generally everything escalates until we wind up in his room and I’m holding him down like Brazilian Jiu Jitsu while he screams until his face turns blue. And he’s a strong kid, it’s not easy to hold him down. Anyway, today I took discipline out of the equation. It was his birthday and I had every intention of spoiling him rotten. Just to get him to go in the car with Rachael to get ice cream of all things involved me negotiating how close he could get to the ice cream building before he had to put his shoes on and then bribing him with the prospect of getting stickers when he got home… THIS WAS ALL SO HE COULD GET HIS FAVORITE TREAT IN THE WHOLE WIDE WORLD: FREAKING ICE CREAM. Not to brag, but they were stickers that I designed and made myself. Earlier this year I came into possession of 20 sheets of printable vinyl sticker paper, I basically bought the wrong product and was too lazy to return it. Well it turns out it’s a nice ace up my sleeve when dealing with whiny kids, I can create any sticker in the world as a bargaining chip. 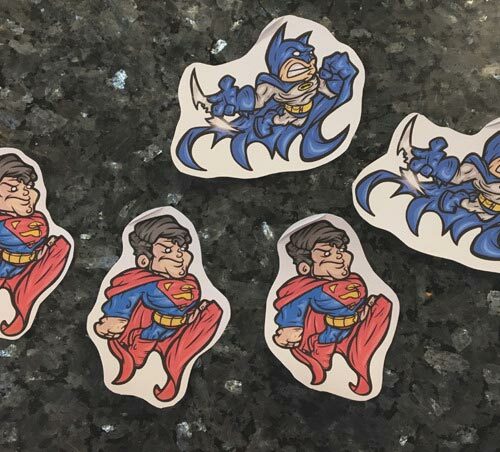 Noli wanted Superman and Batman stickers… I made it so. Of course while I was making the stickers, Milo walked into my office, saw what I was doing and then started demanding his own stickers… Because anything one kid has, the other has to have. He doesn’t even like Superheroes, he likes math and grammar. Milo was pretty dang whiny today as well. I think he was struggling with the amount of attention Noli was getting. I expected as much, but let’s just say it wasn’t Milo’s birthday, so my leniency with the attitude did not extend to him. I feel bad, there’s days where you just kind of spend your day correcting one of your kids. Don’t do that, knock that off, pay attention, put that down, take it easy, stop running, don’t throw that, say you’re sorry, eat your food, go to bed, goodnight. Only children can make you spend all night feeling guilty for trying to keep them alive all day. This year instead of throwing a party at our house or at my parents’ house, we all went to McDonalds. 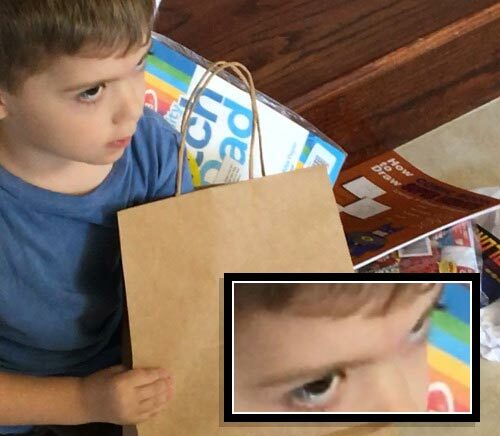 Noli had said a while back that he wanted a “Happy Meal Party”… I have no idea what that is, but I’m sure it’s something stupid that he learned from YouTube Kids. We saw an opportunity, however, to not clean the house and had the family meet up at McDonalds. Pure ghetto birthday bliss. We ate crappy food, let the kids sink their teeth into some mystery meat nuggets (we all know those aren’t chicken) and while the fam conversed and had a good time, my mom and I spent our time talking Noli off the edge - because everytime anybody so much as smiled at him he’d immediately start sliding off the bench in an attempt to hide under the table and throw a fit. He perked up a little once he got some food in him and realized there was a pile of presents with his name all over them. Presents make everybody happy. In addition to all of the junk food he had crammed into his face today, Rachael brought cupcakes for us to wreck our health with. We discretely lit a candle without the McD’s staff noticing and prepared to sing ‘Happy Birthday’ to the little guy… We got the word “Happy” out before he started throwing a fit and everybody just stopped singing (relieved to not have to sing that stupid song in the middle of a crowded McDonalds). He attempted to blow his candle out, failed and just as he was preparing for a second blow, I blew it out real quick so we wouldn’t get in trouble for having fire in a public place… My timing was awful, but luckily he didn’t seem to notice that the candle went out while he was inhaling and proceeded to eat the cupcake. We went home, didn’t have to clean up the aftermath of a kids party, put the boys to bed and as far as we were concerned, it was mission accomplished. Reading through this ramble of a recap, you’d think it was a miserable day… It wasn’t. I choose to write about the more upsetting parts of the day because they’re more interesting to write about, but if you add those ‘rough’ moments up, they were a small portion of what was otherwise a day of celebration. Noli is a treasure. For every tantrum he throws, there’s a million more cuddles, laughs and kisses. I enjoy him a lot. I enjoy all 3 of my boys. 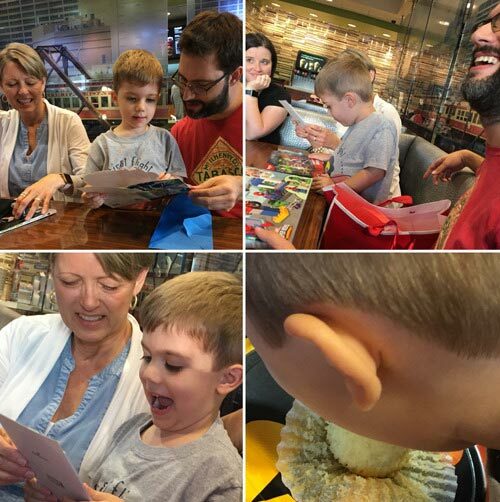 I can write about the insanity of today because it’s fresh in my memory, but a year from now this day will boil down to the memory of my family enjoying a deliciously ghetto faux-birthday party at a crowded McDonalds and joking about how wishing Noli a Happy Birthday made him grumpy. I’m not really sure where I’m going with all this, I guess I’m really just glad that good memories tend to weigh out the bad ones in this family. Today was Noli’s day, he chose to be grumpy, but that doesn’t change the fact that today is a good day regardless. 4 years ago God blessed me. Every day since Noli’s birth has been a gift that I don’t deserve. He makes me laugh, he makes me remember how much fun it was to be little and dream about being a superhero. He loves to draw and I can’t wait to share that part of my life with him, he’s already an amazing little artist. His imagination is wild. I love that and I hope he never loses it. Every parent deals with tantrums, but I’m the only parent who gets to raise Nolan. That makes every hardship worth it. In a nutshell… Noli, I just love you. You’re absolutely perfect.